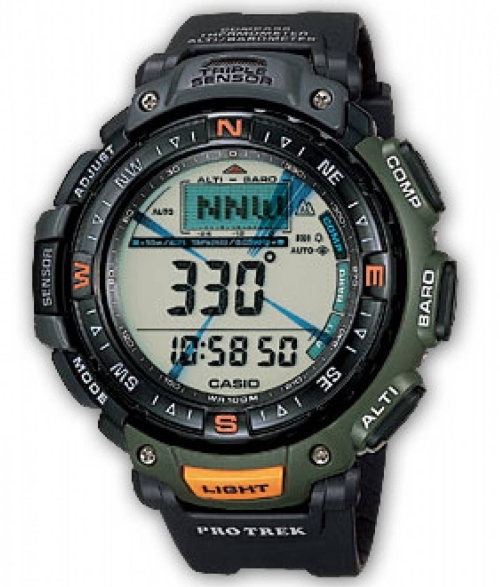 Casio Pro Trek watches utilise Casio's unique Triple Sensor system to accurately measure temperature, barometric pressure and direction. 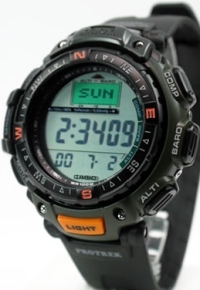 Gents Casio digital stainless steel and green resin case with black resin strap watch. 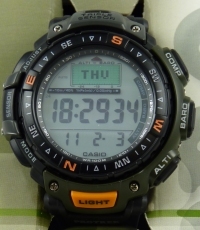 Functions include shock resistant, barometer, altimeter, digital compass, thermometer, stopwatch, countdown, 5x alarms and auto EL backlight. 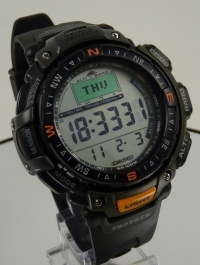 This watch is 100 metres water resistant and comes complete with manuals and presentation box. Not forgetting the PRG 40 always looks good with a business shirt or tracksuit! 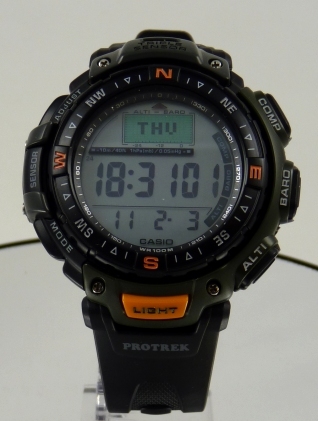 Designed with a large LCD screen, the PRG-40 displays direction, altitude / barometric pressure and temperature readouts. 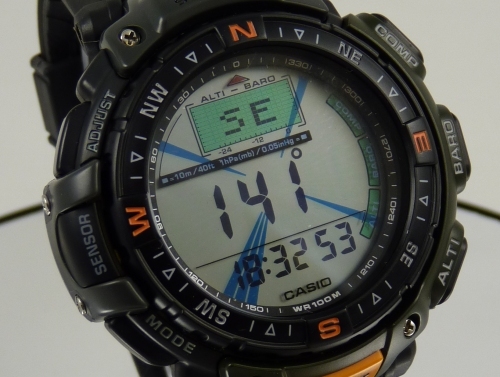 The compass, barometric pressure, and altitude functions of the watch are assigned to separate buttons so data is always at your fingertips whenever you need it. 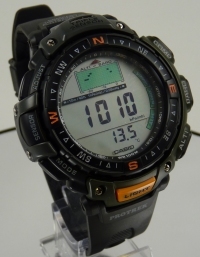 The digital compass can be used to take real-time readings as you move. 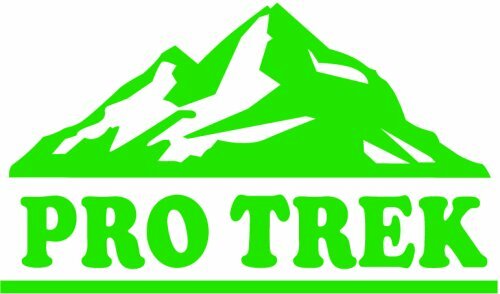 These features, and more, make this model a valuable tool that can provide that extra margin of assurance that your outdoor adventures will always be safe and successful. 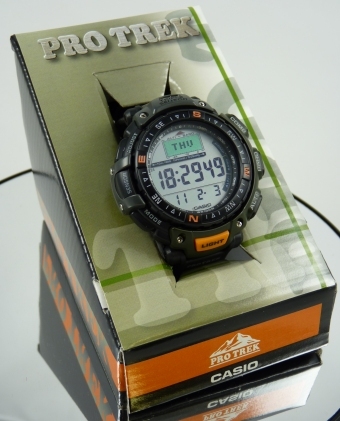 Complete with full instruction and is packaged in original Casio presentation box. The timekeeping module is designed for operation at very low temperatures. The value indicates the lowest temperature at which the module will operate. *-10 ?C resistance does not apply to the direction sensor. Two liquid crystal panels make it possible to select from among different display patterns. A built-in direction sensor detecs magnetic north. An icon appears when it is time to change the battery. 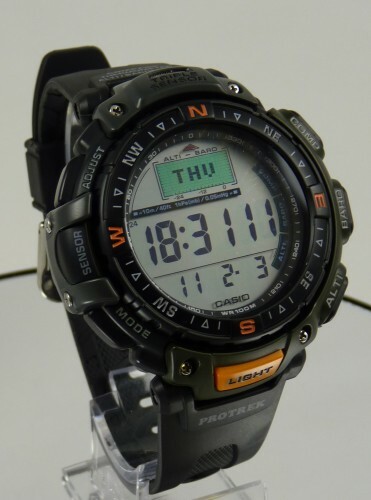 These are ex-display or customer return watches but are in excellent condition, look at my feedback you will not be disappointed these are truly fantastic watches. Please note: All my items are either ex-display or customer returns, direct from major UK retailers and as such will have been opened to check all items are correct and working. Some may show slight signs of being worn, but nothing that will detract from the performance of the watch. I try to describe the items as best as possible, if you have any questions about any specific item please e-mail before bidding and I will be happy to provide any additional information I can.